In mobilization we have two different meanings of “value" which are used in two different contexts. (1) When we “evaluate” (eg project progress) we make a value judgement: right vs wrong, good vs bad, or beautiful vs ugly. (2) When we promote income or wealth generation, in the fight against poverty, we say that money is not wealth as such, but wealth is any good or service that has value, ie. is both scarce and useful. When we add value, we create (generate) wealth. If you take anything of value, say some seeds harvested from your farm, and add some value to it, say by crushing and squeezing the seeds to produce oil and pulp. You have added value. The seeds have more value when you convert them to oil. Similarly, when you take some wood, which has some value, and convert it into a chair, it obtains more value. What value that you have added is wealth that you have created or generated. Any income generation scheme must create wealth rather than merely transfer money or other resources. The aesthetic-value dimension of community is the structure of ideas, sometimes paradoxical, inconsistent, or contradictory, that people have about good and bad, about beautiful and ugly, and about right and wrong, which are the justifications that people may cite to explain their actions. Ideology. A dimension of culture. Basic unit = symbol. See "Culture." Learned; not transmitted genetically. 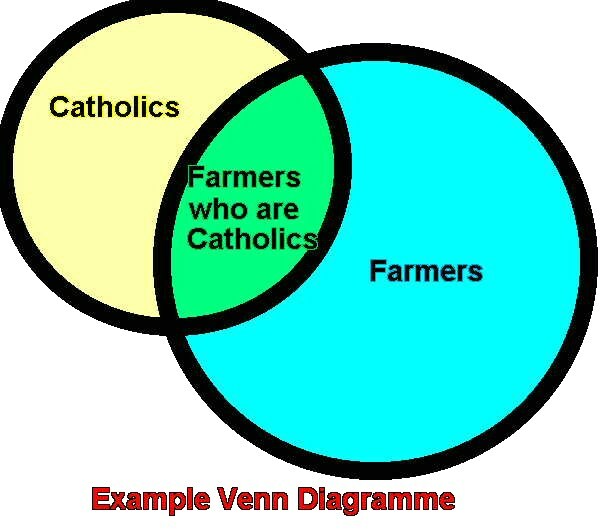 A Venn diagramme is a diagramme consisting of several circles, each circle representing a sub set of a whole. Some of the circles may overlap, indicating that some of the sub sets overlap in some characteristics. In community work and sociology, the whole can be the community and each circle can represent a group within that community. Some of those groups may overlap, and that is represented by where the circles overlap. Whenever there is social change that appears to benefit some people, but others fear they will lose something, there will be resistance to change. When you mobilize a community to change its level of self reliance, there will be some resistance to change. Some of it will merely be because some people are more comfortable with the old way and fear new ways. Others will fear that they will lose (financially, politically) by the change; they have a vested interest in the old way. Here is a very simple example. Say there is a group which has only two classes, very rich and very poor. If you tried to change the group so that all would be the same, the poor would agree (to getting richer) but the rich have vested interests (in staying rich) and would resist the change. A human settlement (habitat) that is characterized by small population, low population density, and social simplicity (eg homogeneity, little division of labour). In ordinary vocabulary, to have "vision" means to be "able to see." In our developmental jargon, to have "vision" is almost spiritual or psychic, being able to see the future, the possibilities of how things could be. A "visionary" is a leader who sees great possibilities. While community members do not all have to be visionaries in that sense, they need to have some idea of what they would like to see their community become. They need a "destination." They need to think of where they would like to go. Before they can plan where to go, they have to know where that "where" is. The job of the mobilizer is to counteract attitudes of complacency, apathy and fatalism, to instil in community members an idea that they can have some control over their destiny, and that they should imagine where they could go. "Vulnerable" generally means "unprotected" or "exposed," implying that someone or something is weak and unable to completely care for itself. In relief work, vulnerable often is used as a collective of children, disabled (physical and mental) and sometimes women. Very often relief work, using the charity method, identifies vulnerable people as the main beneficiaries. In development work, in contrast, we have to resist the idea of giving something for nothing, because that in itself weakens the recipients.